CIW honored with national CCHD award! Last night, at a ceremony in Washington, DC, the CIW was recognized for its work fighting farmworker poverty and modern-day slavery by the Catholic Campaign for Human Development, with the 2008 Sister Margaret Cafferty Development of People Award. 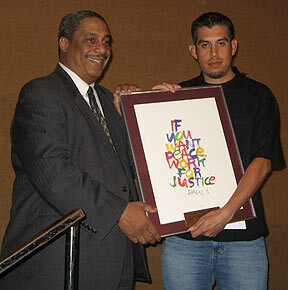 Shown here are Gerardo Reyes of the CIW, right, and CCHD Director Ralph McCloud, with the award. The Catholic Campaign for Human Development is the domestic anti-poverty and social justice program of the U.S. Catholic bishops. Its mission is to address the root causes of poverty in the United States through promotion and support of community-controlled, self-help organizations and through transformative education. The award, named in memory of the late Presentation Sister who served as executive director of the Leadership Conference of Women Religious and a member of the Catholic Bishops’ Committee for CCHD, honors an individual or group who exemplifies a commitment to the development of people and the elimination of poverty. Recipients of this award have made significant contributions to human development and have offered heroic responses to the needs of the economically disadvantaged. The award was established 20 years ago in 1987 and was called the Development of People Award until 1997, when it was renamed in Sister Margaret Cafferty’s honor after her death. The CIW is immensely honored to receive this recognition from CCHD and the US Conference of Catholic Bishops, both of whom have been steadfast allies in our work since the very beginnings of the CIW. We look forward to making CCHD and the USCCB proud of their choice and honoring the memory of Sister Margaret Cafferty with our continued struggle to end modern-day slavery and sweatshop conditions in the fields. CIW LAUNCHES MAJOR NEW ACTION! 2008 CIW “Year of the Worker” Party!